Anyone can get behind in life simply because of circumstances, but we all respond to this differently. While some people feel overwhelmed when they are too far behind, others simply want to push themselves twice as hard to get ahead again. 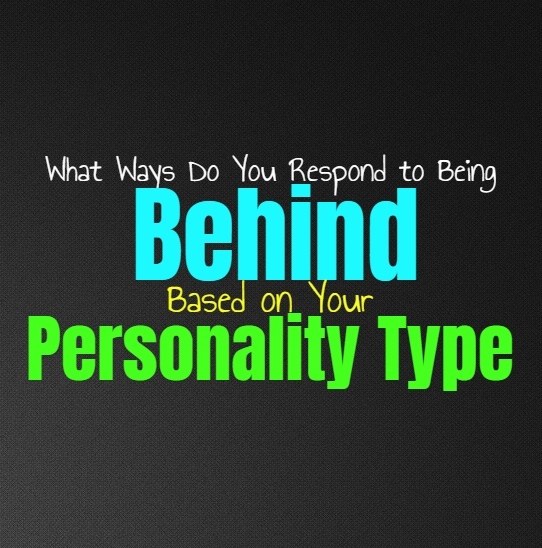 Here is how you respond to feeling behind, based on your personality type. INFJs definitely don’t like feeling as if they are behind, since they can be perfectionists. They can also be rather hard on themselves when they don’t feel like they have done good enough at something. This make it difficult for INFJs when they feel behind, and they can start to really be down on themselves when this happens. At the same time they might get competitive and eventually push to improve as much as they can. When they feel like they are struggling though, it might lead the INFJ to feel like moping a bit. ENFJs are perfectionists with everything they do, and so when they feel like they have gotten behind they definitely struggle with this. The ENFJ will be hard on themselves, searching for the reasons behind their mistakes and wanting to find a way to improve. When they feel too behind to really catch up it can make them struggle to really deal with the situation, feeling like they have too much pressure on their shoulders. Ultimately ENFJs continue to push themselves and will do whatever it takes to overcome these struggles even when it seems impossible. Sometimes when the INFP feels like they have gotten too far behind, it makes them want to give up on this project or situation. They don’t like feeling as if they have to constantly struggle through the entire process simply because they are a bit behind. They would often prefer to start fresh with something else, something they can actually catch up with without feeling exhausted and frustrated. INFPs can be hard on themselves when they are too far behind with things, and so sometimes it is better to focus on something they feel confident in. ENFPs can actually be harder on themselves than people realize, struggling to really deal when they feel too far behind. They will push themselves to improve, but might be on edge and a bit short-tempered during this time period. ENFPs don’t like feeling behind with anything, but they are often good at catching up fairly fast. They likely are annoyed the entire time they have to push themselves to catch up, but in truth it doesn’t often take them long to get back to where they need to be with most challenges. INTJs are definitely perfectionists and don’t like being behind in anything they do. When they feel behind it simply makes them want to push twice as hard in order to get ahead. INTJs don’t just sit around and mope when they feel like they have gotten behind, instead they push to improve and grow. While they might not sit around and are likely to work hard, INTJs can be a bit harsh on themselves internally. INTJs might be confident people but they are also perfectionists with most things and this makes them harder on themselves than people realize. ENTJs don’t like feeling behind in anything, since they value efficiency and hardwork. When they feel like they have somehow gotten behind then they want to push as hard as they can to get ahead once again. ENTJs will simply find whatever means possible to obtain their goals and to get themselves back into being efficient and focused in the situation. While ENTJs can certainly feel frustrated when they have gotten behind, they simply need to take it one step at a time and continue to keep moving forward. INTPs don’t really become bothered everytime they feel behind in something, but it does depend on the specific situation. If they feel behind in something which they value and believe to be important, then they can become rather frustrated by this. The INTP will either retreat inward and take time to process this, or they will want to hurriedly dive into the subject in order to catch themselves up to where they want to be. INTPs don’t mind the challenge and might enjoy being able to immerse themselves so that they no longer feel behind. ENTPs take on new challenges and don’t mind feeling like they need to push to catch up. While they don’t necessarily enjoy feeling behind, they will likely take it as an opportunity to dive into this subjects and catch up appropriately. ENTPs want to be well versed in just about everything, but sometimes it can be challenging to keep up when they are constantly bouncing around. So for them it is nice to have new things they can take on as a challenge to really master. ISTJs truly despise when they feel like they are behind or not completely prepared for something. They will often feel very stressed in this situation and want to find a way to catch up as fast as they can. The ISTJ will push themselves and often try to achieve the impossible when they feel too behind. For ISTJs it is important to always be efficient and to be knowledgeable, and so when they get behind it does feel a bit draining and upsetting for them. ESTJs really don’t appreciate feeling behind in anything, since they value efficiency and competency. They want to feel like they are ahead of the crowd, always prepared and knowledgeable in everything they do. When the ESTJ feels like they have gotten behind they will do their very best to overcome this and push themselves to get ahead once again. They are strong-willed people who are perfectly capable of taking on the challenge and pushing themselves to achieve the near impossible. ISFJs can be rather hard on themselves when they feel like they have gotten behind in things. When they realize they are a bit behind it makes them want to push to overcome this and get back to where they need to be. Sometimes this can be stressful for them though, since ISFJs want to always be just a little bit ahead of where they need to be. Sometimes it leaves them feeling like they have failed, but that doesn’t mean they won’t push to get ahead. ESFJs can be really hard on themselves when they feel like they have gotten behind. They might feel a bit panicked and overwhelmed when they realize they are behind in something. ESFJs do sometimes feel the need to start over or move onto something else when they are just too far behind to cope. Most of the time though, they are capable of pushing themselves to get back to where they need to be. ESFJs don’t want to feel like they have failed their loved ones in any way, and so when they are behind it can feel like they have let people down. ISTPs aren’t afraid of bouncing around or moving onto something new, and so they don’t always get upset if they feel behind in something. Since they are constantly diving into new experiences, they do find themselves a bit behind sometimes. They simply take on the challenge and enjoy being immersed in something in messier way like this, since it actually helps them learn even better. ESTPs often find themselves jumping into new things since they really don’t enjoy stagnancy, and so they can sometimes be used to being just a bit behind. When they feel behind they simply want to immerse themselves in the experience and learn more about it. They are very good at catching up when they are behind in something, and so they don’t often worry too much when they are in this type of situation. ISFPs can become upset when they feel like they are behind in things, but it depends on the situation. If they are behind in something they really don’t enjoy doing, it makes them feel truly overwhelmed and exhausted by the situation. ISFPs would rather experience things which fulfill them, and enjoy being able to immerse themselves in their passions. If they are behind in something simply because they are trying something new, then they can cope just fine with this. ESFPs don’t mind feeling like they are behind in something, as long as people are willing to teach them and help them improve. They enjoy being able to experience new things and often realize they cannot be ahead on everything. ESFPs are happy to dive into something and find ways to really learn about it as they go along. They are often far more capable of catching up with these things than people realize, making it less stressful for them.